I’d never been to Ginger before so was looking forward to trying it out. A quick scan over the menu revealed lots of fish/sea food, including Creamy seafood chowder, Crispy skin fillet of sea bass, Local fillet of skin-on cod and the Whole fish of the day. There was also a large dedicated vegetarian menu, which had a noteworthy 6 starters and 4 mains- which delighted the vegetarian in our company. 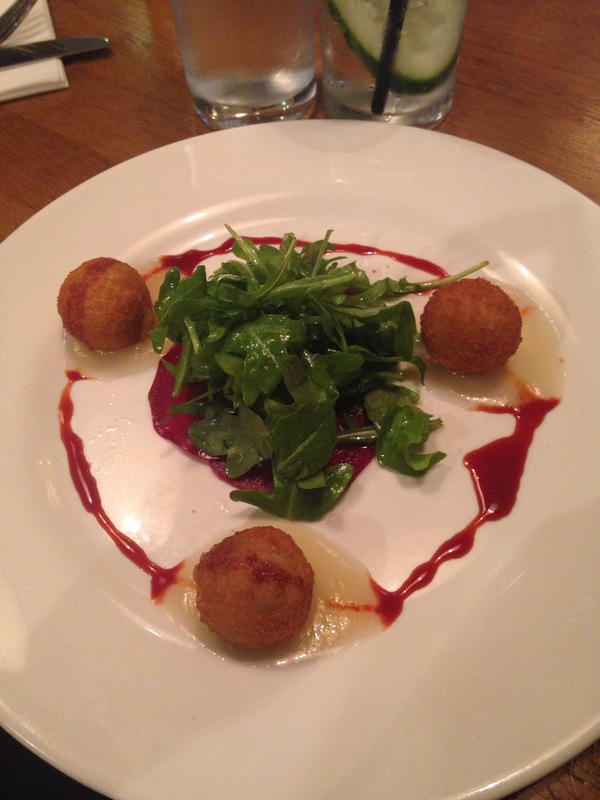 I picked my starter from said vegetarian menu, deciding upon the warm salad of fried Cheddar fritters with pear puree, beetroot and rocket. For mains, it was back to the main menu for Ginger marinated breast of chicken with stir fried bok Choi, roasted peanuts, pineapple and noodles. The fresh flavours of the chicken dish was particularly impressive. We all gave Ginger a thumbs up- especially for the good choice of dishes available to diners. The restaurant has a pre-theatre meal so worth trying out if you’re heading over to a show. Previous postWIN £100 M&S GIFT CARD WITH THE BIG BEACH CLEAN UP!